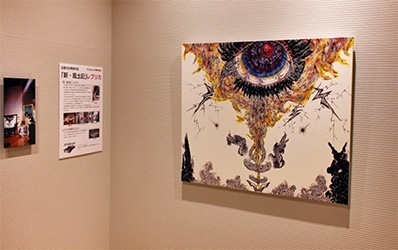 Mimaki was asked by an exhibition organizer and Ms. Miwa Komatsu to create a replica painting of "Shin-Fudoki"* using a Mimaki inkjet printer. Since the "Shin-Fudoki" has been dedicated to Izumo-taisha*, an original painting was unobtainable. Fudoki: Name of an ancient report that was submitted to the central government from each regional office. Izumo-taisha: The most ancient and important shrine in Japan. Digital photograph data of the painting were processed by an image processing software to create a perfect replica. The data were rasterized by RasterLink6 and printed. Several small print samples were printed in different print conditions. Ms. Komatsu selected the best print. 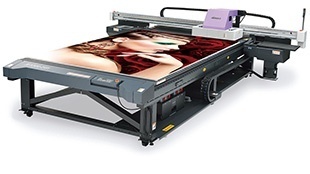 Mimaki JFX500-2131 employs IMS* control that ensures high ink dot placement accuracy. 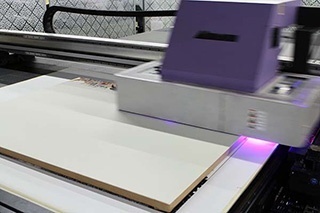 JFX500 is a large format flat bed printer but enables printing of clear and legible small characters in a font size of 2 pt. Such high accurate print technology faithfully reproduced delicate lines of an original painting. Thanks to an anti-banding function "MAPS II"*, dynamic brushwork was smoothly represented on boundaries between print swathes without uneven color. 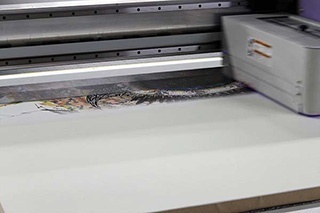 Mimaki's superior inkjet technology is capable of controlling three different sizes of ink droplets and it reproduced beautiful and smooth gradation of the original painting. Ms. Komatsu examined the replica and was satisfied with the print results. Since the replica met her high requirements, she ordered two more replica paintings for her upcoming exhibitions. 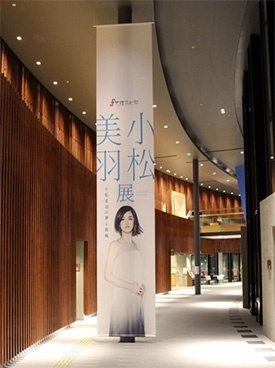 Born in Nagano, Japan, in 1984. She displays her artistic talent in a wide range of genres including copperplate engraving, painting, Kimono design, and porcelain painting. 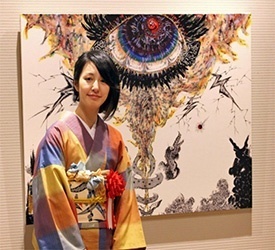 Her artworks have unique aesthetics and move a viewer's emotions. "Shin-Fudoki" was dedicated to Izumo-taisha by Ms. Komatsu on May 11, 2014. She formally visited "Kamiari-sai" held at Izumo-taisha in November 2013, and gained strong inspiration from this event. After visiting Izumo-taisha, she offered to dedicate her painting to the shrine. The shrine administration accepted her proposal. She stayed in Izumo and created a painting for over a month. 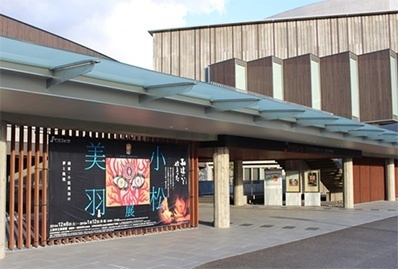 During her stay in Izumo, she was exposed to local cultures through reading Japanese ancient stories, "Kojiki" and "Fudoki," and visiting many shrines. Those experiences made her think about the universe. A star shaped diamond is placed in the center of the painting. Additionally, one can see the universe and a blazing fetus who has a spirit of reconciliation in an eye. When the painting was dedicated to the shrine, the diamond emitted a light when Shinto prayers were started. At that time, there was neither a window nor a light source; however, several people saw the light. It was the moment when the universe and the painting were linked at a sacred place, Izumo. Powerful combination of Speed and Quality.